The National Climate Assessment is big, bad, and scary. It always is. However, tucked between the warnings of death and doom, there is hope. A lot of this hope relates to indigenous communities in the U.S. In fact, as one of the demographics set to be hardest hit by climate change and rising sea levels, indigenous communities have no choice but to remain hopeful. Their traditional knowledge may be the answer to their—and our—sustainable future. That much the report makes clear: Protecting and passing along this knowledge is “vital for ongoing adaptation and survival,” according to the report. At the same time, the rapid pace of climate change is challenging the way indigenous peoples have historically lived their lives in sync with nature, meaning these communities need more support now than ever. Traditional indigenous knowledge stems from centuries (and even millennia) of indigenous people living in close connection with their natural environment. It’s what helps indigenous communities thrive on their land. The migration patterns of animals, or the seasonal appearance of a plant, for instance, have helped communities to time and perfect when and how to hunt, fish, and farm. Today, local communities and indigenous peoples around the world help manage as much as 65 percent of land globally, according to a 2015 report. Often times, traditional knowledge doesn’t just emphasize humans; it’s about nurturing a relationship with the natural world and all the living creatures that provide for people. To many cultures, the mountains and animals that graze upon them aren’t just neighbors—they’re relatives. So there’s a level of respect that helps keep everything in balance. That’s why this knowledge base is mentioned in the assessment in the first place. Many climate adaptation plans that tribal governments and indigenous communities are whipping up feature some level of traditional knowledge. These efforts include partnering with scientists and government institutions—like at the He’eia National Estuarine Research Reserve in He’eia, Hawaii, where Native Hawaiians are using ancient land management practices to revive their freshwater reserves and help restore nearby coral reefs. In drier climates out west, adaptations that use traditional knowledge might revolve around water, a resource Western society needs to learn to better manage, Brabec says. The climate assessment makes that clear, too: Droughts will intensify in the Southwest, and that’ll mean even less water. So we better take good care of the water we do have—something indigenous knowledge can help other communities figure out, per Brabec. Instead of privatizing water, for example, traditional knowledge may prioritize making it accessible to all. There are myriad ways society can benefit from indigenous knowledge. For instance, climate scientists are now working with Alaskan Native hunters to document changing Arctic ice conditions. However, the people who rely on this knowledge every day—to subsistence hunt, for example—are struggling to come to terms with the changes they’re seeing on their land. These changes are outside historical patterns, so this traditional knowledge? In some cases, it seems to be losing its place. Losing their sense of place and associated cultural practices will be devastating for indigenous communities, said Berbac. There’s actually a term for this loss: solastalgia. “That’s going to destabilize culture, and it’s going to destabilize communities,” Berbac told Earther. This is especially true for communities in Alaska. 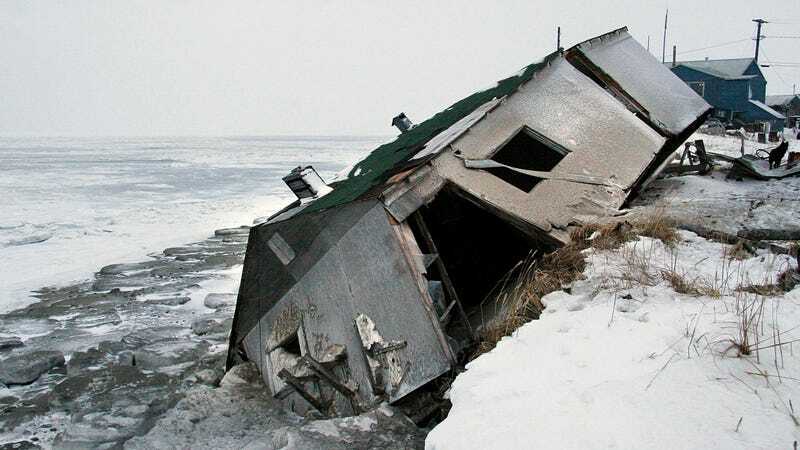 Many have witnessed a loss of sea ice through the years, which impacts their ability to access historic hunting grounds. Coastlines are crumbling, taking down infrastructure with them. Entire communities are being forced to move because they aren’t safe anymore where they are. For Alaskans, feelings of depression related to climate change have become common, according to the national report. Olivia Lee, a research professor at the International Arctic Research Center at the University of Alaska Fairbanks, has seen this firsthand. She works with coastal communities in Alaska’s North Slope. Mental health is a real problem that’s hard to hide and can lead to substance abuse, which is why many of the communities Lee works with are dry aka they allow no alcohol. Plus, all this erosion is also damaging communication infrastructure, which can further isolate entire villages. Little Diomede Island in the middle of the Bering Strait, for example, used to rely on sea ice to form a runway on which airplanes could land. Now that that sea ice has become rare, leaving is that much harder, said Lee. “There are a lot of things that make it difficult, I think, for communities to be resilient and find ways to adapt to these changes,” Lee said. The indigenous people in these frontline communities—whether it’s a freezing Alaskan village or tropical Hawaii—need government resources and support to stand against the changes coming their way. Often, they willingly gift their knowledge to the world—even if it’s not in their best interest—but that knowledge might not be enough to save their way of life.